Black pepper is a favored spice, included in most recipes, making it a difficult allergen to avoid. Producers derive this spice from dried berries from pepper trees, known as peppercorns, growing primarily in southern India, Ceylon and Malaysia. Food allergies are more commonly experienced by children, with many fortunate enough to outgrow their childhood allergies; however, if you continue to be plagued by an allergy to black pepper, you may experience symptoms that range from mild discomfort to serious and potentially lethal. If you have a parent with an allergy, you are 75 percent more likely to develop one within your lifetime, according to the University of Maryland Medical Center. When you have a food allergy, consuming the offending food activates your immune system. Food allergies are different than a food intolerance, which does not prompt an immune reaction. Allergies have no cure; however, some lucky folks outgrow them. An allergic reaction typically occurs within a few minutes to two hours after consuming the allergen. Symptoms of an allergy to black pepper, like any food allergy, can range from annoying to life-threatening. According to MayoClinic.com, common symptoms include hives, tingling or itching inside your mouth, abdominal pain, diarrhea, nausea and vomiting. You may also experience wheezing and congestion, dizziness or lightheadedness. Swelling of the lips, tongue, mouth and throat are troublesome symptoms, while more severe symptoms include anaphylaxis, a potentially fatal constricting of your airways. Anaphylaxis requires immediate medical intervention. Your doctor may diagnose a food allergy based on exposure to an allergen and present symptoms; however, it is prudent to pursue further testing. Generally, your health care professional will begin by obtaining a history of symptoms experienced after eating particular foods. Your doctor may suggest that you keep a food diary and eliminate certain foods to see if symptoms stop, or she may order skin scratch tests. Your doctor may also order blood tests to check whether your body is having an immune response, known as immunoglobulin. Your doctor will then send the tests for further testing in a laboratory to check which are the offending foods. 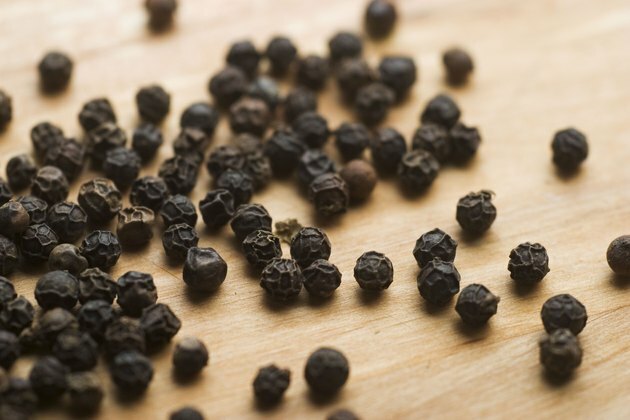 Treatment for exposure to black pepper will depend entirely on the nature of your allergic reaction. The goal of treatment is to lessen your symptoms and discomfort, while minimizing chances of reactions later on. Antihistamines may be effective for minor reactions, while severe reactions may require a shot of epinephrine and a doctor's visit. Prevention is your best bet. Discuss your allergy with your server in restaurants and the hosts of events, and check ingredient lists diligently in the grocery store.